The Honeycrisp Apple was adopted as the state fruit in 2006. The Honeycrisp™ apple (Malus pumila cultivar Honeycrisp) was adopted as the state fruit in 2006. 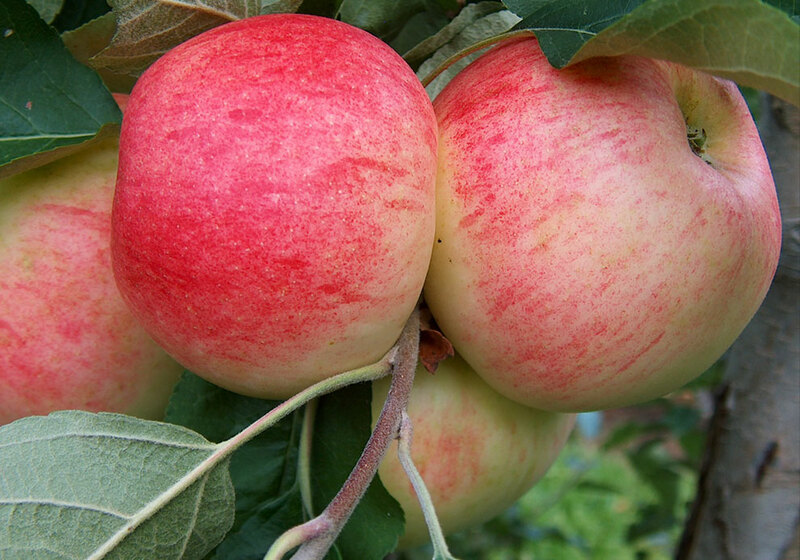 The apple was produced from a 1960 cross of Macoun and Honeygold apples, as part of the University of Minnesota apple breeding program to develop a winter-hardy tree with high quality fruit. The original seedling was planted in 1962. Today, millions of honeycrisp apple trees are grown across the U.S. and Canada and as far away as South Africa and New Zealand. Honeycrisp apples are about three inches in diameter. Their skin color is 60 to 90 percent mottled red over a yellow background. The fruit surface has shallow dimples and numerous, small dots with green russeting at the stem end. Honeycrisp apples are characterized by an exceptionally crisp and juicy texture. They are harvested from mid-September to mid-October in east central Minnesota; the optimum harvest usually occurs the last week of September. Honeycrisp apples from Fireside Orchard near Northfield are pictured here. Learn more at the University of Minnesota.